Ready for a new level of comfort? Lean back in a big and tall desk chair to get the support you need for maximum productivity. Even better, a Realspace big and tall chair looks as good as it feels for a more stylish work area. Overall Dimensions: 47 5/8in.H x 27 15/16in.W x 30 5/16in.D. Engineered by NASA, memory foam is precision-designed for durability and comfort! Padded armrests give an extra dose of comfort, especially while on a conference call or speaking with someone in your office. Realspace big and tall chair is designed to accommodate virtually any user. Weight capacity tested to support 350 lb. Offers tilt tension adjustment so you can sit back at your own comfort level. Plus, tilt lock lets you snap the chair into one place, without the back moving backward and forward as you move. 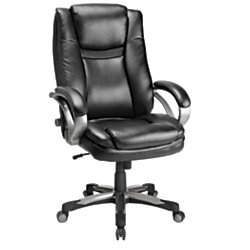 Black leather executive chair features bonded leather on the seating surface. Luxurious bonded leather meets memory foam - making the workday feel like a spa day. Lumbar can be adjusted to support your back in the ultimate position. The adjustable back height can move upward or downward to best fit your torso. Meets and/or exceeds ANSI/BIFMA performance standards. Assembly is required.